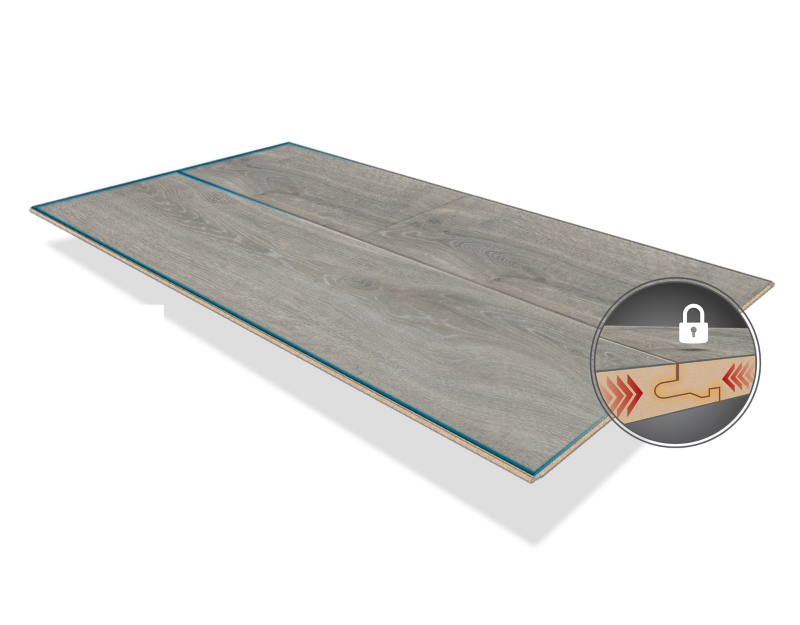 For years, tile has been the only option for waterproof flooring – but it’s 2019, and now there are waterproof wood-look luxury vinyl, laminate and even carpet options! 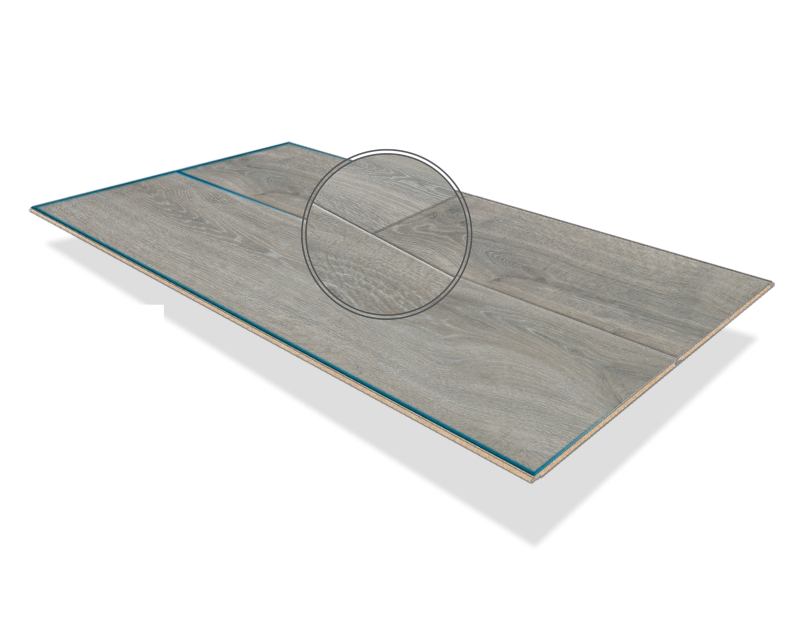 The team at Dolphin Carpet & Tile wants to show you, in detail, 2019’s biggest waterproof flooring styles. 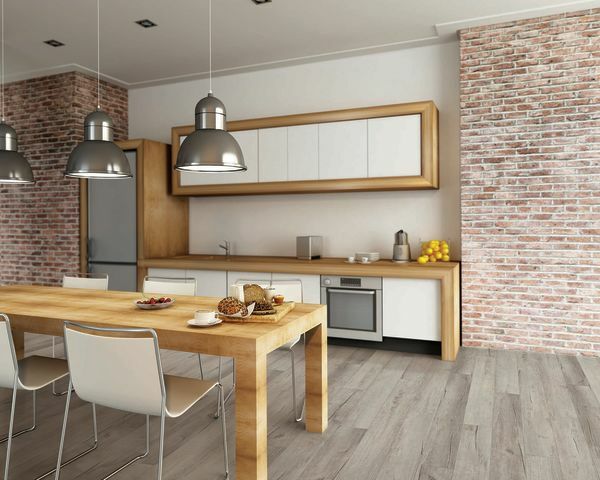 With gorgeous looks and durable features, you’ll either feel lucky that you have one of these flooring types, or you’ll start planning your remodel! A 100% waterproof luxury vinyl brand that has been a very popular trend is COREtec. 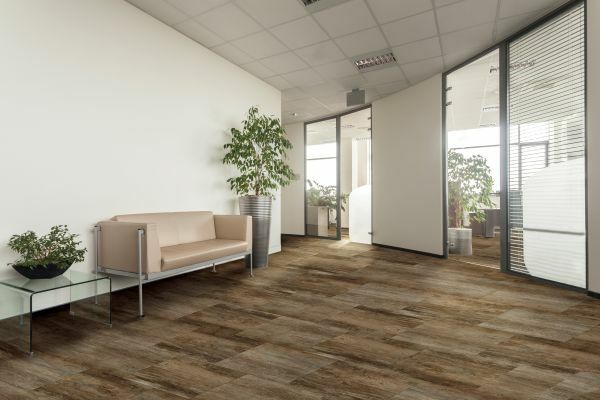 COREtec is composed of environmentally-friendly recycled wood and bamboo dust, containing an extruded core that provides additional strength and density – more so than any regular luxury vinyl plank. COREtec is made up of four layers. Used to protect against excessive wear. The layer you will see after installation. Durable and resilient, resisting chips and dents. Won’t expand or contract under normal conditions. Naturally resists mold and mildew. 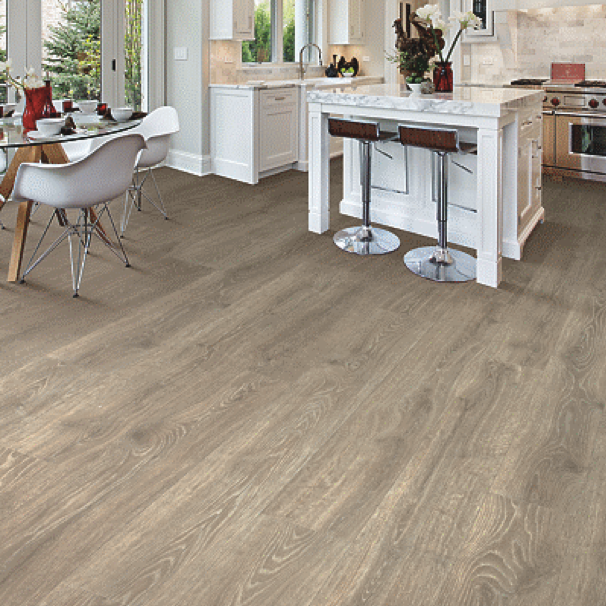 Not only does this COREtec vinyl look flawless in this rustic kitchen, but grey flooring is also a top trend this year. With the Chesapeake Oak option, you’ll be trending in more ways than one! The Edinburgh Oak of COREtec’s Pro Plus Enhanced option guarantees timeless elegance that lasts a life time. Mohawk recently came out with Revwood+ flooring, a 100% waterproof laminate that is made from real wood. With the exception of the top protective wear layer, each component is made exclusively from real wood. However, its waterproof functionality allows it to be installed in any room of the home, making it suited to high-traffic and high-moisture areas. If Revwood+ is made from real wood, how can it be waterproof? It’s all in the construction and installation! There are three main components that go into the installation process. Mohawk created joints that are milled to extremely small tolerances, making it an incredibly tight joint that prevents water from seeping through the surface layer. 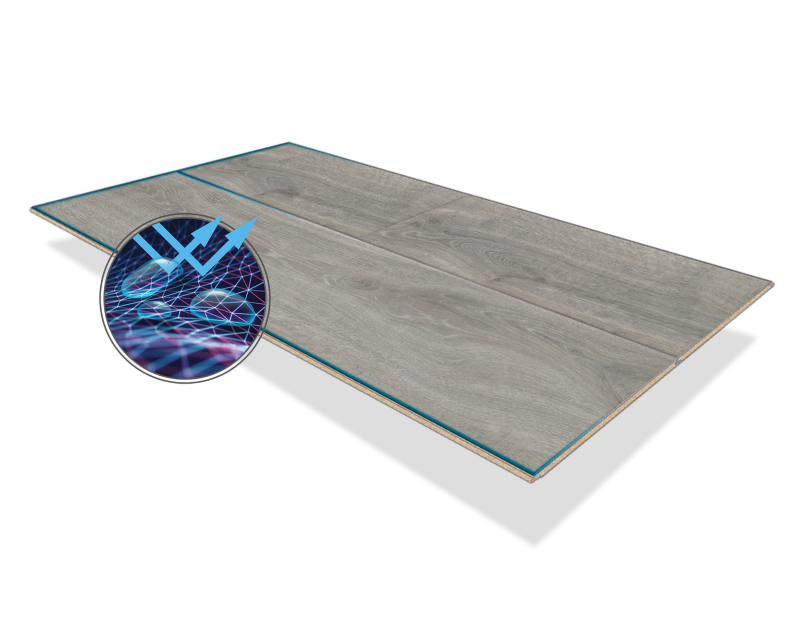 Revwood+ has a beveled edge, causing the laminate to roll over the edge, flow into the Uniclic joint, and add another layer of protection from water. This is a 100% silicone sealant that guarantees true spill protection and gets applied all around the perimeter of the floor. With the beauty of real hardwood, Revwood+ gives maximum scratch protection, All Pet Plus Protection and, of course, a 100% waterproof flooring system. Shaw flooring remains the industry leader for residential waterproof carpet because of two magically high-performance product lines. 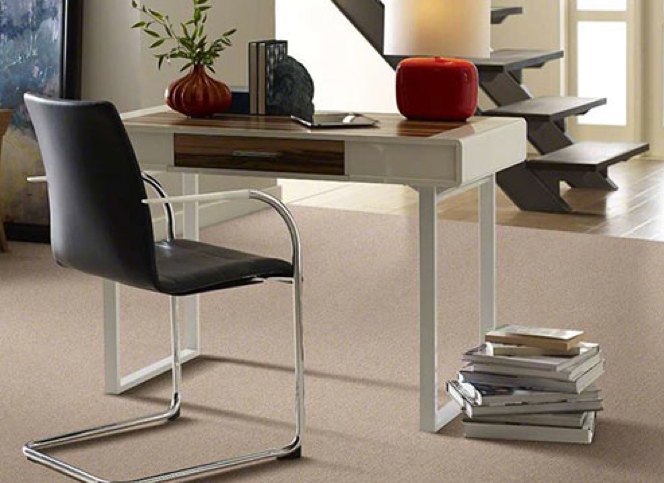 Shaw RX2 is a stain and soil repellent technology, protecting carpet fibers from dirt and spills. The best part about the RX2 is that spills that reach the base of the carpet get wicked back to the surface. The backing of many Shaw carpets is made from 100% thermoplastic commercial grade Lifeguard backing. No liquid will penetrate that. If you want your new flooring to be carpet, definitely consider waterproof. You’ll no longer have to worry about mold, mildew, spills or stains! The carpet has got you covered! At Dolphin Carpet & Tile, we know that life can be crazy, especially with big families, pets, and the unfortunate clumsiness that happens every now and then. That’s why we’ve shown you the best waterproof flooring brands to consider for your home so you can relax even when life gets crazy! Find all of these great products and more when you shop with us at any of our ten locations in the greater Miami metro area!